The rugs within the Diamond collection are made in a variety of sizes and consist of five popular colour-ways, all of which incorporate a variety of stunning colours and hues. Whether the accent colour in your room is red, brown, cream or black, the modern and stylish rugs in this collection will fit perfectly. The simple yet effective pattern of these rugs will create an eye-catching effect on any floorspace and when paired with similar shapes and colours within your room such as a coffee table, floating shelves and some artwork, this cheap rug will become the centrepiece of your room. 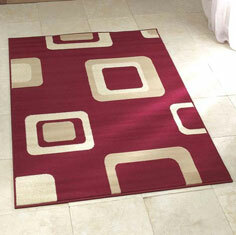 Diamond rugs are made from 100% polypropylene the rug is machine bound on all four sides. This range is colourfast, anti-static, stain resistant and anti-shed.